The air was crisp and the skies sunny today. We spent it quietly together. 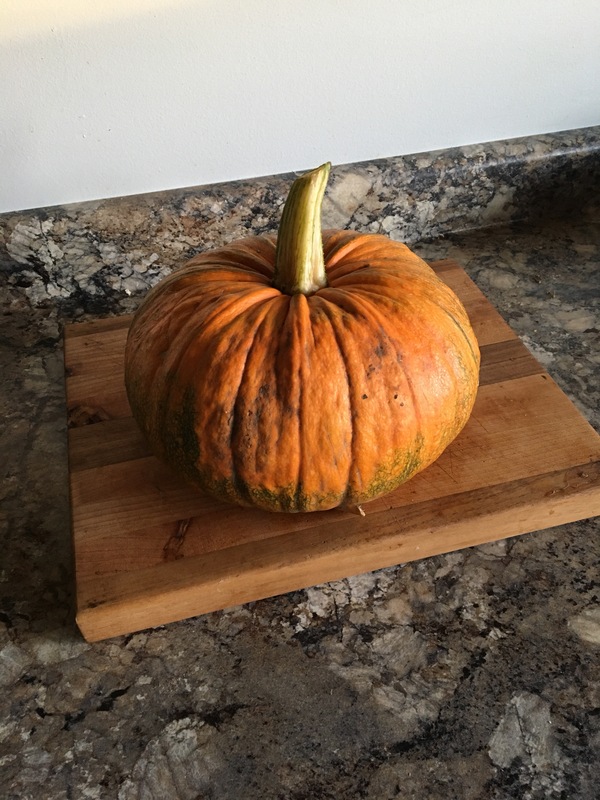 We spent all Summer growing this sweet pie pumpkin in our garden and it was perfectly ready for harvesting this weekend. Scooping out a pumpkin whether for a jack o’ lantern or for a pie is a favourite Practical Life work around here. This process is so amazingly rewarding because the child is a part of it right from the beginning months ago. There have been many Nature walks in the forest lately but today was about leaf gathering to compliment our newest book on the bookshelf. 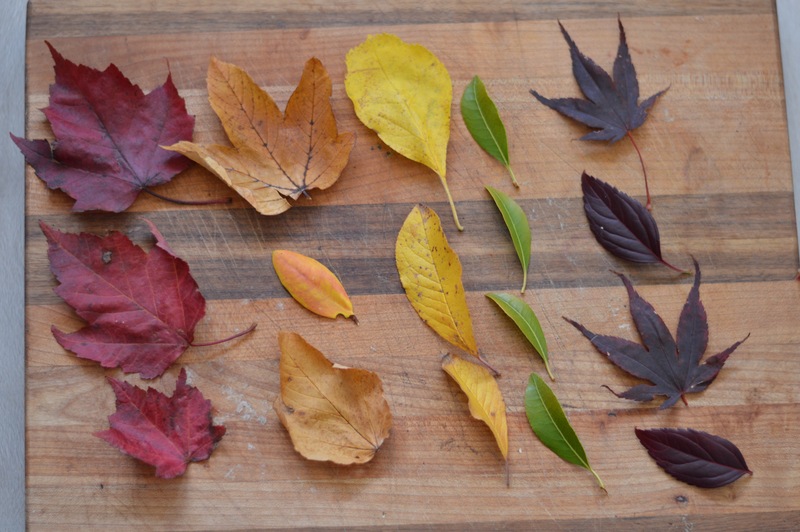 We loved finding many of the leaves found in the gorgeous book Fall Walk. 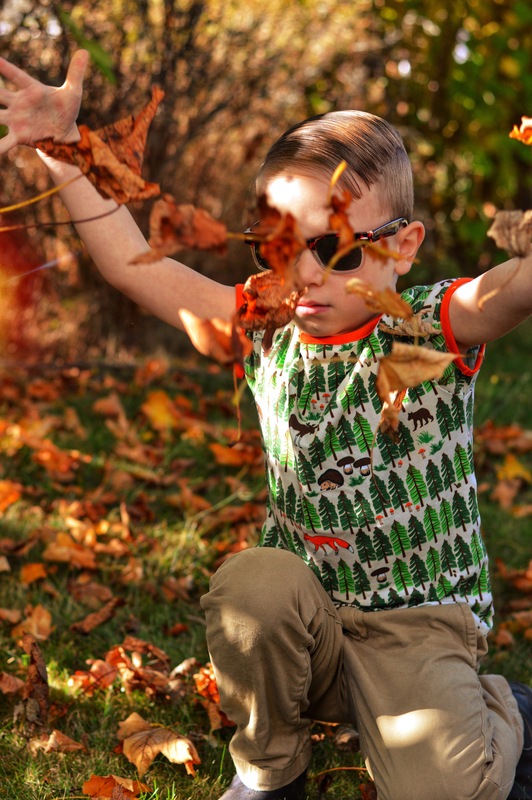 It is a beautiful poem of a family out enjoying an Autumn day and the information regarding so many different leaves is fascinating and easily could be used for many years to come both at home and in the school classroom. As we Canadians sit down with our extended families over a meal this holiday weekend we wish all of you much happiness and we are so extremely grateful to have you all following along here and our other media outlets. Practical Life, the heartbeat of the home. If I had to start all over these 6 are the ones I would rush out and buy. And, as an added bonus, each of them is under $10. For anyone just starting out, these 6 favourites will completely transform your child’s role in the kitchen. Your child will now (after a little guidance) be able to make their own snack and help prep family meals. Such an amazing feeling of independence for the child. 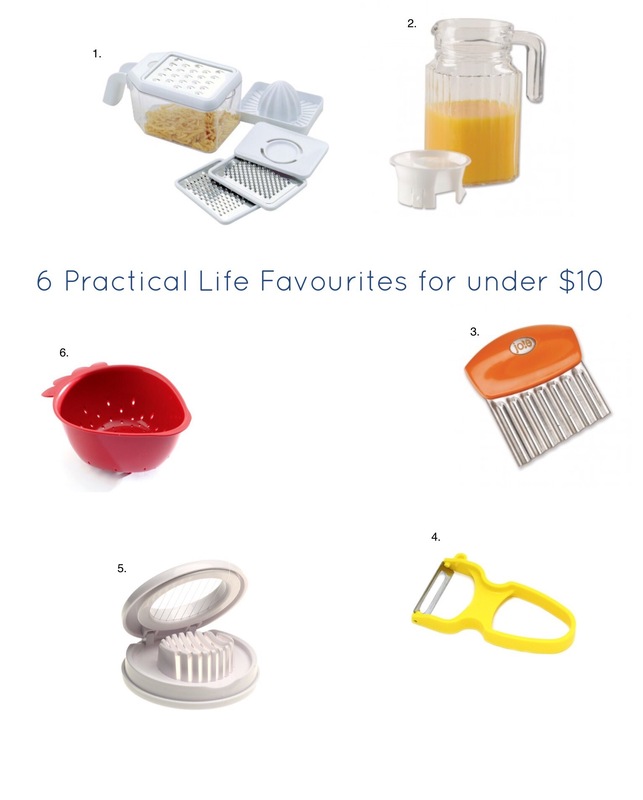 Do you have favourite child sized kitchen tools? Have you found something you can’t live without at your house or classroom? Leave a comment. We are always looking for products to review. 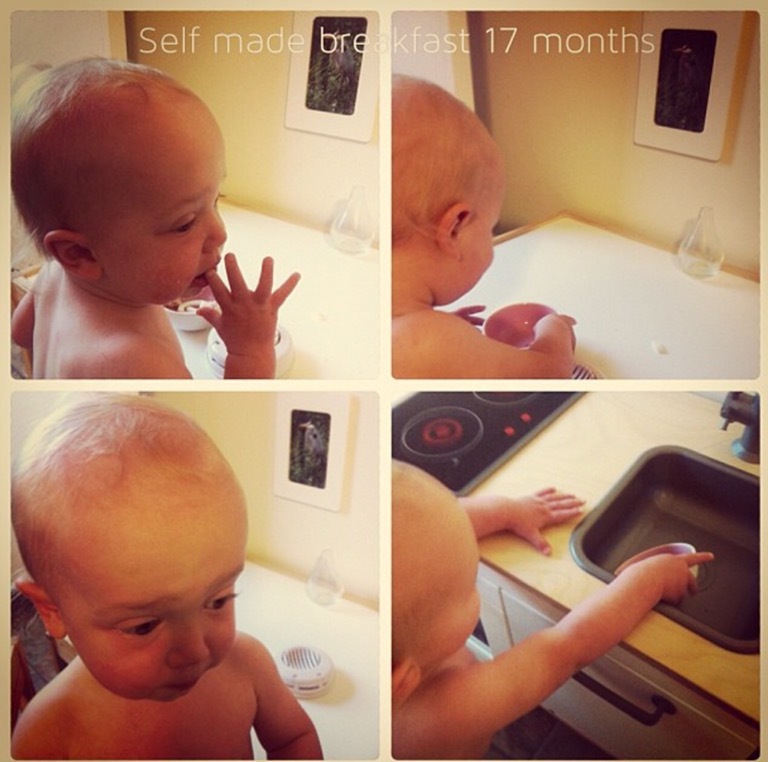 Quentin has been prepping food and since he was 17 months old. At 4 he is fairly self sufficient. 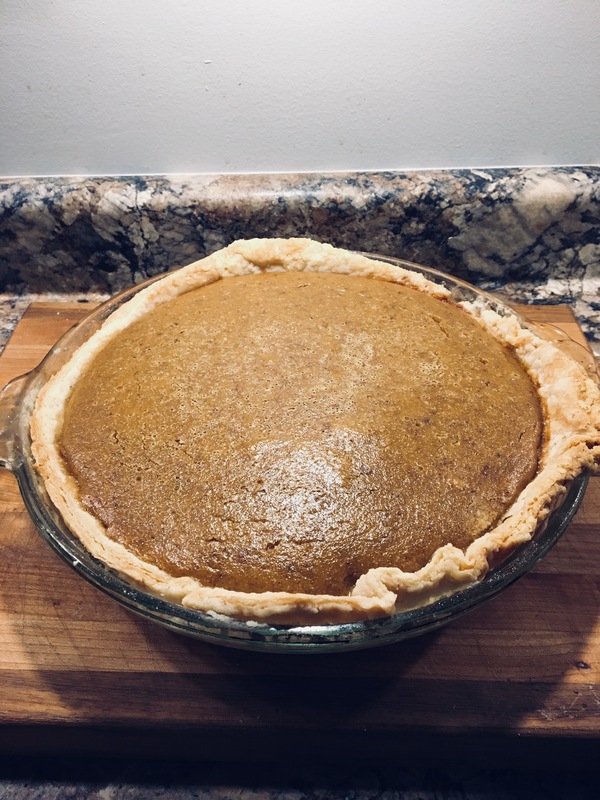 We have recently added cooking with heat as seen here in this post. Having child sized real tools is crucial, but so is trusting your child. He now uses a regular kitchen knife. It is sharp enough to cut through carrots and other hard vegetables. 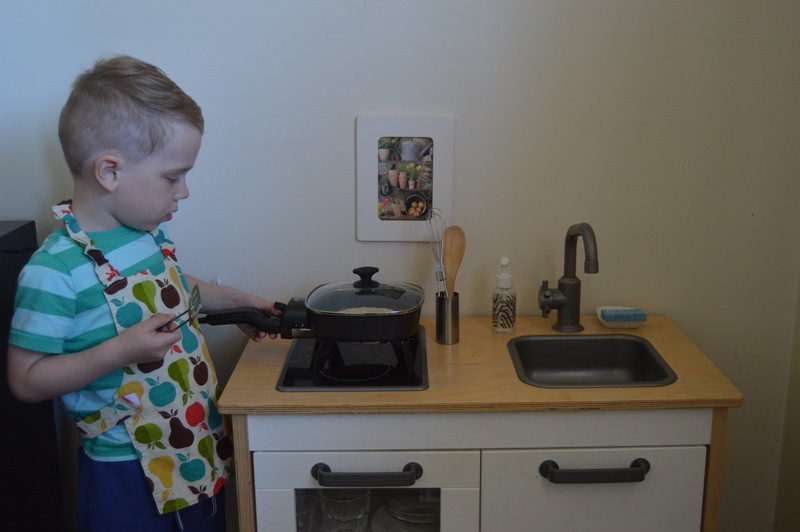 His electric skillet (we use this one) gets hot enough to actually cook things quickly. This is not carelessness on our part. It happened slowly, with small steps mastered first and of course there is always adult supervision. The items pictured above are his most used food prep tools. The small grater is perfect because it has many attachments so he can use it as a grater, zester, juicer etc. His small rolling pin is the perfect weight for his still tiny hands and he has become pretty good at rolling out pastry. ﻿The kitchen is such an integral part of the home. It’s where families come together. If your child has yet to try some food prep, start slowly. Observe them to find their interest. Being in the kitchen is a wonderful way to connect to each other. Of all the questions I recieve about Montessori, our little kitchen gets more questions than anything else. So, I decided I’d better put all the details in one place. 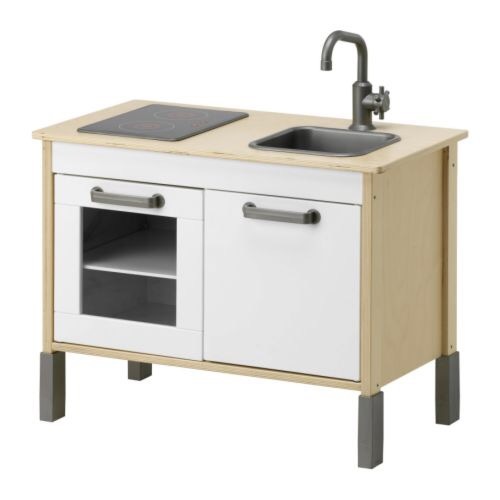 We bought this IKEA kitchen for Quentin for his first Christmas. An odd gift to give a premature 8 month old yes, but he had just started to wean, and we knew it would be perfect in the upcoming years. 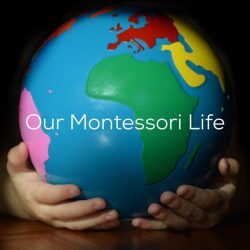 There is nothing more important in Montessori than respect for the child, and with that, there is no greater respect than the Prepared Environment. Somewhere that is their own. Somewhere they can keep their things independently, neatly and in a reachable space. This picture was first featured here. It is our first set up of the kitchen. It houses Quentin’s tiny porcelain weaning glasses, first dishes and some fun yet practical kitchen tools that waited for the day he could use them. Just like when we set up his Care of Self area in the bathroom featured here, we set up the kitchen far earlier than he could use it. The Absorbent Mind of a child is always watching. A parent or teacher needs only to model the behaviour consistently for the child to start mimicking it on their own. He watched us remove his dishes, return them, clear his dirty ones to the tiny sink. And so it wasn’t long before he was doing it independently. Here he is just after turning one. At this point it was mostly exploration. But it quickly became more. 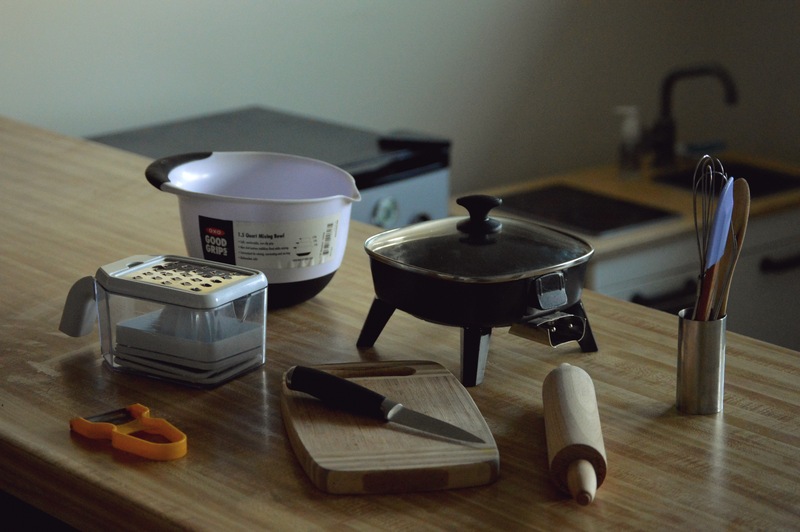 I wrote a post here about our essential kitchen tools. Although we have added many more now, these 6 are still our important ones. These are the ones that get used everyday. Providing your child with real working tools is critical in Montessori. 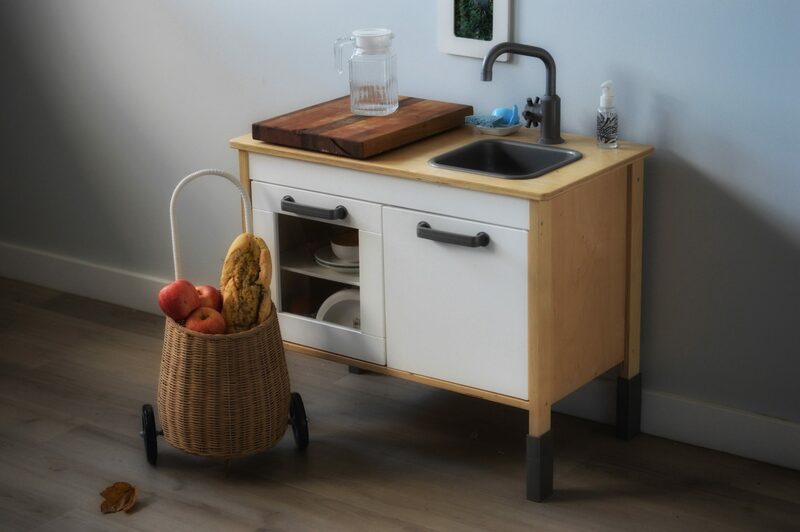 This has never been a play kitchen. He slices, chops, pours, strains and peels real food. Some may become alarmed at the thought of small children using sharp knives and tools. However, it is extremely important children be given the trust from an early age. There must be many lessons on safety, concentration, and use. These don’t simply come because you tell your child to be careful and then hand over a knife. Modelling, many experiences and dialogue with a parent are needed. 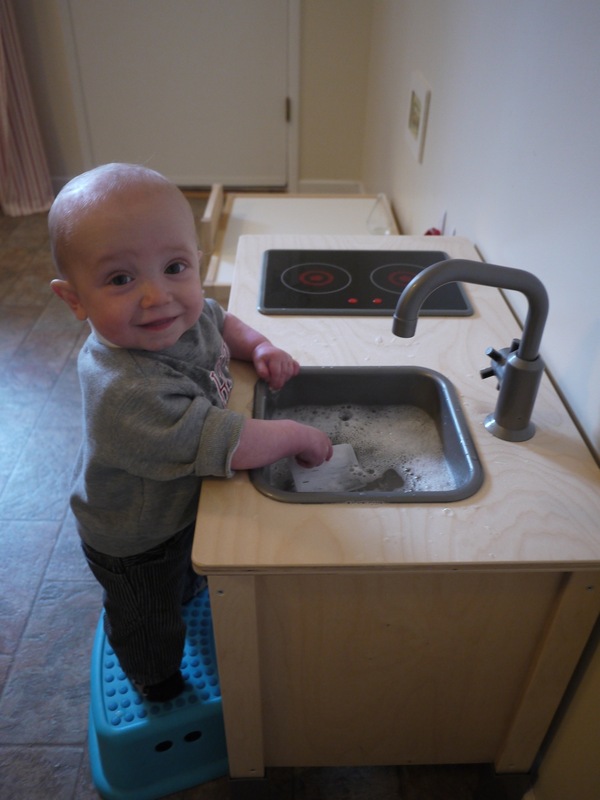 Here he is just before two years old washing his dishes. 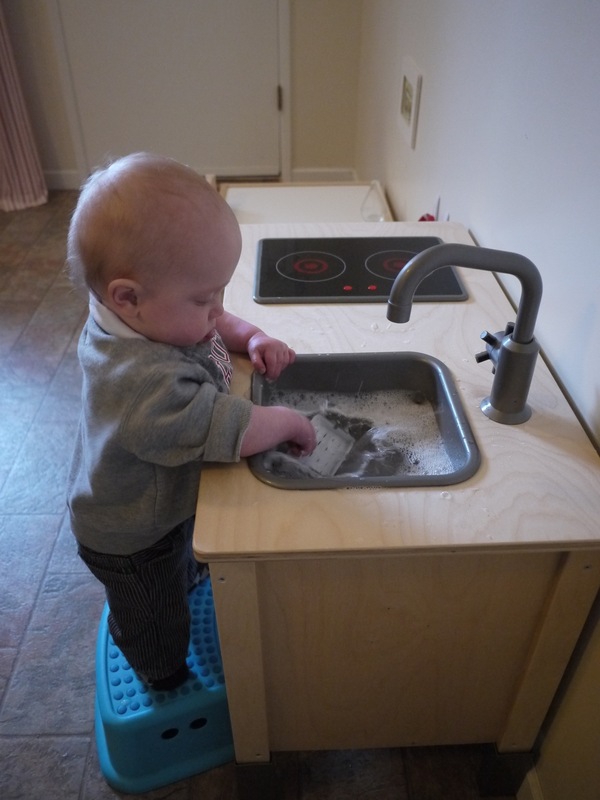 A small liquid soap dispenser and dish to hold a sponge (half the size) allowed him complete independence at an early age. 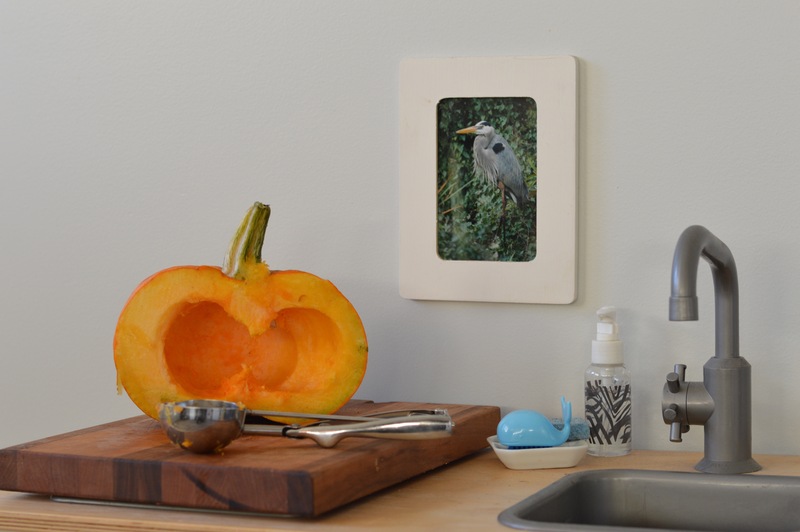 We installed hooks beside the kitchen to keep his aprons within easy reach. 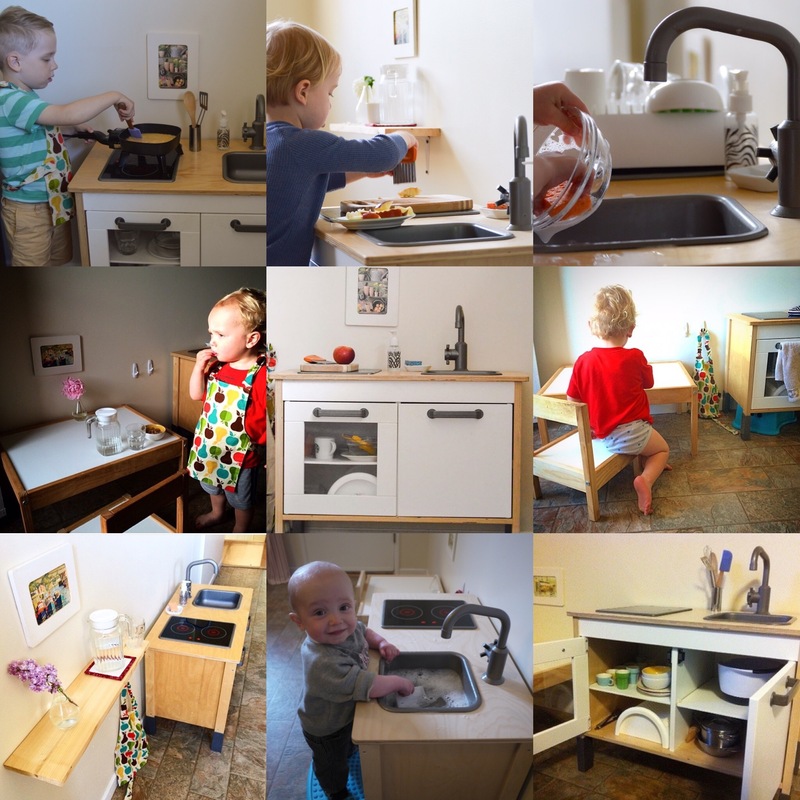 Many of our kitchen accessories came from Montessori Services. We don’t have plumbing on this wall. The cost of installing plumbing was completely unreasonable when he will only use the kitchen for less than 7 or 8 years. We drilled a hole in the bottom of the plastic sink and he uses a flat plug. He fills the sink with warm water from a pitcher and when done, pulls the plug and it emptied into a bowl inside on the shelf at that time. It now drains out a little hose and into a bucket that he empties. These were all the first skills he required. His kitchen has evolved over time so that now, at four it includes cooking with heat. 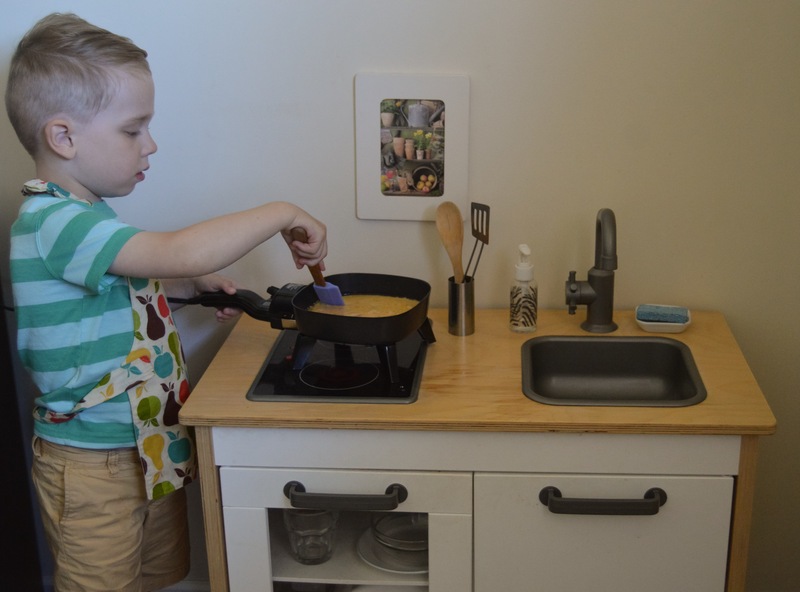 A small electric skillet allows him to cook a variety of things. Above a veggie burger for his lunch. Below he’s making scrambled eggs for our dinner. I’ll get the disclaimer out of the way now: He is capable, but he is still young. Whenever Quentin is using heat or a sharp blade, I always have both eyes and my full attention on him. His independence and his safety are my responsibility. So, how does one replicate this? It’s like anything else you would put on your child’s Montessori shelves. This is a process of many steps. Start small, with one task at at time. If they don’t put away their own dishes now, they are not ready to cook independently. Modelling is key. 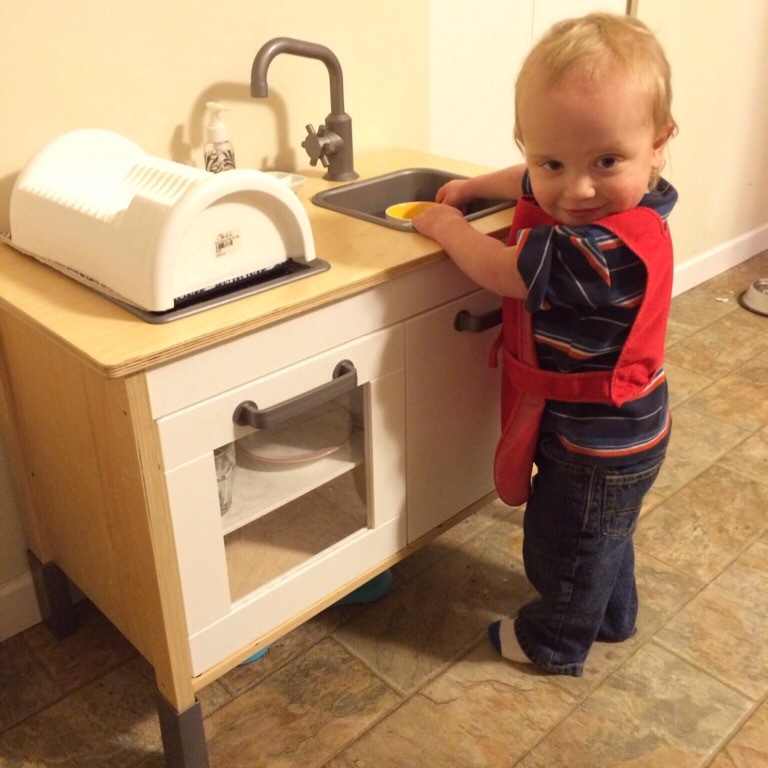 Show them how to wash dishes, cut fruit, peel vegetables. This is joyful work to children. Not chores. Keep the environment based in reality. If you truly want them to do Practical Life kitchen work, the kitchen must be real. There must be a useable surface space. There must be a useable sink. 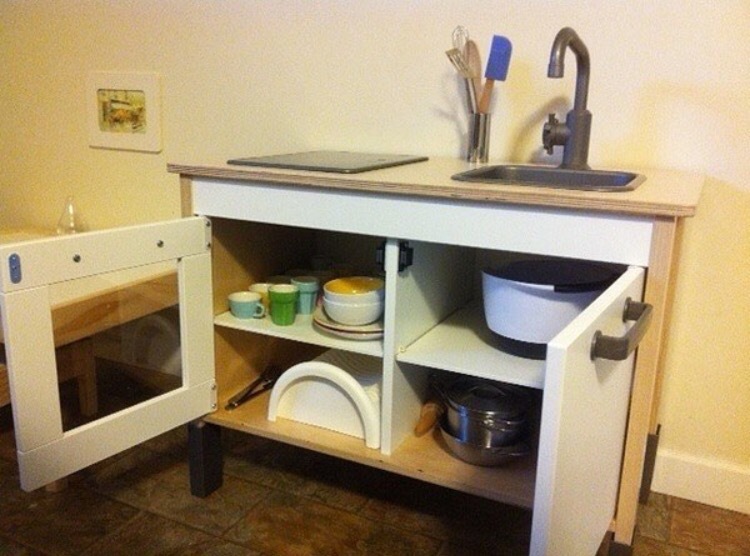 There are so many play kitchens on the market. Brightly coloured ones with flashing lights or sounds, and media characters. These along with play food, toy utensils and the lack of water and heat will confuse the child ultimately setting them up for failure. If you truly want them to succeed, look for a kitchen that you would love to use. Please feel free to leave questions or comments and I will do my best to answer them.